The city of San Diego is creating a designated zones on roadways for riders to park their scooters and bikes. They will place the small parking where red zones prohibit cars from parking. The city calls these new parking spaces “corrals.” The intent is to get scooters and bikes off sidewalks, roads, and other pedestrian walkways. Many residents complain about riders of motorized scooters. They accuse them of riding recklessly and at unsafe speeds. 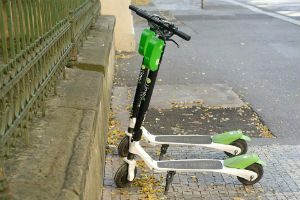 Residents also complain that scooters are left in front of their houses and on their lawns. The city plans to carve out roughly 330 designated spaces across the city. The cost comes out of the current transportation budget. San Diego estimates that there are roughly 20,000 shared bikes, e-bikes and scooters in the city. Six companies in the city offer shared scooters and bikes. This June city council will introduce several new laws aimed at regulating these companies and the use of their products. In addition to parking corrals, Mayor Greg Block also proposed regulations for reduced speed in certain areas. He also proposed fees and permitting for scooter and bicycle companies. Scooter advocates say that they save emissions from short car trips and provide cheap and safe transportation for those who cannot afford a vehicle.